Simple light from the hot desert sun is entering the palace from the right, casting shadows to the left. 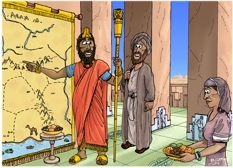 From left to right: King Darius (in red and gold robes), gesturing towards a large tapestry map of his empire, Daniel (in grey robes), a servant girl carrying a bowl of fruit. This scene shows king Darius gesturing at a tapestry map of his empire in the palace of the king, Babylon. The narrative of Daniel in the lions’ den is set in Babylon, the capital city of the Middle Eastern Babylonian/Median empire. I’ve done a lot of research for this set of scenes depicting the story of Daniel in the lions’ den. Since this story is set in Babylon, in the Middle East, it was important to me to differentiate between the architecture, clothing, furnishings and other elements of the scenes in this story from many of the others I have drawn where the narrative depicts scenes set in Israel. For example I have drawn an opulent, square columned palace here in Babylon, compared with the more modest, rough stone buildings I usually depict in many of my scenes set in the villages, towns, cities, etc of Israel. Similarly, I wanted the clothing of the principle characters to be Babylonian/Median in look, with flowing, wrap-around cloaks much in evidence. I still have Daniel in my more typical Hebrew garments, although I expect his clothing was replaced with richer clothing cut in a typical Babylonian/Median style to befit his position and status in the royal court, once he was transported to Babylon. At the end of Daniel chp 5, the last Babylonian king (Belshazzar) is overthrown by Darius the Mede, and chapter 6 opens with Darius dividing his kingdom up into 120 regions or provinces. This fact is represented by the large tapestry map seen on the wall of the palace in the first 2 scenes of this set of Bible Cartoons. Note the tapestry map, which shows the eastern portion of the empire, what would be modern day Iraq, Iran, and parts of India.